New on the market is this fantastic duplex apartment enjoying breathtaking views of Valletta from its terraces. Layout comprises of an entrance hall, kitchen/breakfast leading to the front terrace, a living/dining. On the upper level one will find 5 bedrooms (main with ensuite) utility room, box room and cloak room. The lower level a 5th bedroom, a study leading to a large back terrace. Property being offered highly finished and fully furnished. Included in the price is a 2 car lock-up garage. Tigne Point is a high end residential and commercial development which is located on the Sliema Peninsula overlooking Valletta Harbour. This former military barracks has been transformed in to luxury apartment blocks, Malta’s largest shopping mall and boasts some of the finest restaurants on the Island. 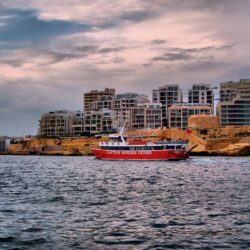 It’s location in the heart of Sliema has attracted a lot of foreign investment. Disclaimer - Property reference 240071097-1866. The information displayed about this property comprises a property advertisement. PropertyMarket.com.mt makes no warranty as to the accuracy or completeness of the advertisement or any linked or associated information. The information is provided and maintained by REMAX.